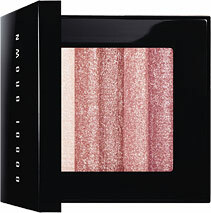 The Bobbi Brown Shimmer Brick. It is like a mythical creature that you hear about but never have been able to come in contact with... My latest issue of Elle says that it is Katie Holmes favorite thing (that must mean something, somewhere??). As the snow comes down in sheets across my dull, pale skin here in the Midwest, I realize that it is meant to be. I need this thing that is shimmery and may make me look glowing and alive. At any cost. I say at any cost because at $42, it is not inexpensive, but I will pay just about anything to not look like a zombie at this point. I also have purchased numerous knock offs, attempting to achieve a glowing, sun-kissed complexion. So why not just get the real deal? I hear that it last forever when the colors are swirled and applied with a kabuki brush.. Thanks for the comment and cool blog! I have this and love it. It really does last a long time. I've been using a soft brush and there is no end in sight. I love the colors as they seem to have blue rather than yellow undertones. Will definitely give the Shimmer brick a try. Love the shimmery look for blushers - very summery! The colors in this palette are so pretty. Unfortunately it is a bit too expensive for my budget. I have always loved bobbi brown's products. Am looking forward to get my hands on these. Thanks for the tips about using the kabuki brush! It is! And it lasts for ever!